Please lock if info has already been posted. I was searching Nike TN on eBay and noticed the orange blaze AM Plus was available and was listed as a 2013 retro. I used google and found this article posted back in April on Sneakernews. Are these scheduled to release stateside or just overseas? Any overseas site I can purchase from? Help will be greatly appreciated. Probably my favorite AM style and one of the best colorways. From what I have seen, it was a Euro/Asia exclusive. They dropped April 29th and Footlocker Europe has all the colorways and in basically full size runs. Lucky for me, I had a friend in Japan get me the last 12 from Atmos in Japan early this month for 14,700 yen, roughly $150. All in all I got mine for $194 shipped to me. mrnzoe, skip2mylou23, 36 ounces and 4 others like this. Thanks for the info. Hopefully I can cop a pair for a reasonable price. Can't seem to find any overseas site that has them. I looked everywhere for them. Had my brother try a stock locate at his store to see if any Footlockers in the U.S got them with no luck. I looked at every European site that I knew about and with the exchange rate it was just more than I wanted to spend. Roughly $240+. Cheapest way is to find someone somewhere in Asia that can help you out. Getting them from Europe would run you almost the same amount that you would pay on eBay, so if you really want them that bad, I say go for it if they have your size. You will find some on Ebay but be prepared to pay big bucks. Otherwise try to find a hookup from EU or Japan... Don't think these will release in USA but you never know. Yeah I saw them on eBay, damn near $300 . Hell, I only paid $150 for this DS pair of Hyper Blues. Think they were overseas drop in the early 2000s. But I doubt they drop in the US, being that they're more popular overseas. They nice. Ebay would have them. ebay is where you might would from them the cheapest. hellaones and charmcitykid like this. obviously, you didn't read a single thing in this thread. Still have my OGs from 99. I would love a pair of the orange ones. A couple of us talked about it in this thread. I bought the orange one from Atmos using Rakuten last month. They still have a few sizes left. they need to stop playin wit that neon upper on the blue pair. this is good news...they have to release these eventually. I always thought they were cool sneakers. MAN I remember having these, as well as the gray with the light blue. I bought even though they were a half size to small, I remember take my foot out during class every so often to breath. I need the orange ones in my life. Only colorway I had was the red/black/yellow from 2001.
loved them but i don't know if i'd be all that interested in a retro. ^^^^^ It's just the different lighting. I've had the OG and this retro and they're damn near identical in appearance (OG ran a bit smaller though). My pair is a 12. They are VERY hard to find though. Guess my OG's were the second release then. 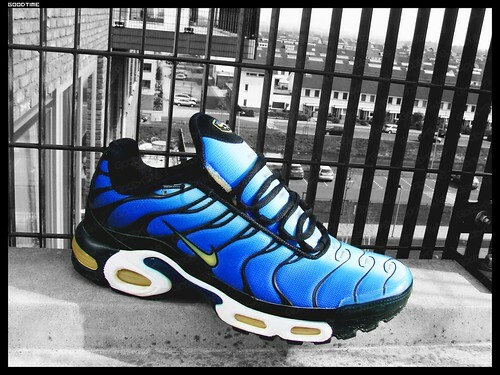 I think there was another retro of the same tiger colourway around 2003 along with another retro of the Hyper Blue's too, both had a blackened toe guard if I remember rightly.